With the Christmas season upon us, it is a time for merriment. Office parties, community-league gatherings and get-togethers at friends and relatives homes. It is the time of year when you can imbibe in some spiked eggnog, or a lovely merlot and feel good about grabbing that cute guy's bottom. It's the season for normally shy and awkward dudes to feel brazen and bold enough to approach that pretty lady across the room and ask if they are wearing any underwear. Because what could be more festive than going commando in a sub-arctic climate? So, in keeping with my Sunday tradition, (you know, the one where I post a pun instead of actually having to think up a real post,) I present to you my Christmas cheese cheer. And because I believe in quantity vs. quality at Christmas, you get a two-for-one. So enjoy. Go forth and be merry. One Christmas, Dan and Stan built a skating rink in the middle of a pasture. "Look at that," remarked Dan to Stan. "That guy is trying to pull the wool over our ice!" This one is dedicated to my good buddy, Kimmy K. Because she is such a classy and clever gal. Cheers! 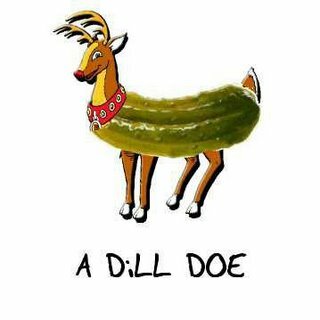 What do you get when you cross a pickle and a reindeer?